Voting is open Monday, April 8th at 8:00 am through midnight on Sunday, April 14th. Hard copy ballots are available in the back of the narthex. Links to ballots were emailed to all. Bios of nominations are below. ​The Women of St. Patrick’s provides many social, spiritual and service opportunities for its members. It unites the women of the parish in a community of faith and service and offers each member the opportunity to use her individual talents. Our Circles – Sign Up Today! Amanda Pfeifer is an energetic and driven community leader with a desire to serve her Heavenly Father, help others and make the world a better place. She is a busy stay-at-home mom to two boys Harrison (St Pats Pre-K) and Tommy (21 months), and happily married to her husband Aaron of nine years. Amanda currently serves as leader of the St. Gianna Circle (Moms of Littles Daytime), as a member of the Human Needs committee, and as Communications Manager for St. Patrick’s Home and School. She is an active member of St. Teresa Service Circle and regularly assists with Liturgy of the Word for Children. Amanda strives everyday to do the work that God has called her to do through the use of the time and talents with which she has been so blessed. Prior to her role as stay-at-home mom, Amanda was a successful logistics professional. She spent 9 years working for a Fortune 200 company in various leadership roles in finance, pricing and sales. Most recently she served as Director of Intermodal Operations responsible for the just-in-time supply chain delivery of production and non production auto parts for Chrysler, Ford, Honda in the NAFTA corridor. Her responsibilities included oversight of operations and the management of a 31 person team including 7 individuals at the border and in Mexico. In addition to her extensive finance and logistics experience, Amanda is also a trained corporate auditor. Amanda holds a BS in business administration from Creighton University. Over the last year, Amanda has stepped outside of her role as mother and homemaker to play an active role within parish. In the aftermath of Hurricane Harvey in the Fall of 2017, she led an effort to provide immediate aide the people of south Texas. Under her leadership, she helped the community gather and deliver five truckloads of supplies to KIPP Houston Public Schools and other shelters in need. She has taken on leadership roles within the Women of St. Patrick’s Board and served as co-chair for Monster Mash Trunk or Treat, the Birthday Bash for Jesus, and the Spring Fellowship Forum. In addition, she collaborated with three other circles to plan the first annual Ladies Luau Bingo night this winter. Amanda is interested in using her time and talents in the coming year to serve as Vice President of the Women of St. Patrick’s Executive Board and to ensure future success of this ministry. Her proven leadership experience, strong communication and organizational skills would be an asset to bring together the women of the parish, and work cross functionally with circle and other other parish leaders to further the mission of the parish. Amanda is a faith driven leader who operates with the mantra of “See it. Own it. Solve it. Do it.” She values diversity of opinions, and knows that for good ideas and true innovation to occur, conflict, argument and debate is a necessity. Amanda’s vision is for the Women of St. Patrick’s to be inclusive of women of all ages and walks of life, and a place for a woman to find fellowship, further her faith, feed her soul and to give back to her community. She desires for leaders to be excited about the potential of this ministry. In the coming year, she would like to see the Women of St. Patrick’s to equip circle leaders with the tools needed to be successful leaders, to increase member participation at board meetings and events, and to provide regular financial and philanthropic support to the community, school and parish. Melissa Peal has been a parishioner at St. Patrick’s for many years. She grew up in Omaha and was fortunate to attend Catholic Schools including St. James, St. Robert’s and Marian High School. 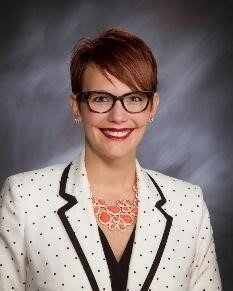 She graduated from UNL in 2003 with a degree in Elementary Education and earned a Masters in Reading a few years later. She has been teaching for 15 years and have taught third grade at St. Patrick’s for the past 12 years. She has been married to her husband, Brad, for 13 years. They have a daughter, Emma, who is in first grade at St. Patrick’s. Together, they enjoy cheering on the Jays, spending time outdoors, and traveling to new places. Melissa’s schedule revolves around St. Pat’s- whether it be teaching, attending Emma’s St. Pat’s sporting events, co-leading their Daisy troop, or attending Mass- St. Patrick’s is a second home to her, and she feels blessed to be a part of such a special community. Melissa was thrilled last year when the Women of St. Patrick’s was created. As a working mother, she thinks it is important to feel connected to the parish, not only through weekend masses, but also through smaller groups. This group has helped faith-filled women form friendships and seek out ways to serve God and one another. She feels very lucky to be one of those women! Melissa would love the position of Secretary on this Executive Board. She is meticulous, detail-oriented, and loves to make to-do lists! As an educator, she seeks to enable students to develop their strengths and feel confident in their abilities. These skills are necessary to help guide others toward their goals. She is compassionate, empathetic, and deeply care about each of her students. She believe these qualities allow her to help others feel loved and appreciated. Melissa thinks it is important to continue to provide time for the larger group to meet for special events throughout the year, as well as continue to encourage smaller circles to form. She thinks it is imperative that we reach out to women each year, so newer members of the parish or even women who have not had a chance to learn about the circles feel welcome. Melissa believes that the sky is the limit when it comes to the future of Women of St. Patrick’s. Our talents far exceed our imaginations, and she know God will help to direct our paths to help one another and our community at large. It is incredible what we have accomplished in a short period of time- from the fun events including the Halloween Monster Mash and Christmas Birthday Bash to the life-changing Hurricane Harvey drive. Melissa is excited for the opportunity to continue to spiritually grow with this unique group of women and lead others to Christ. Desireé Macaitis and her husband, Jim, have been married for 10 years and a part of St. Patrick's for 6 years after moving back to Omaha from Denver, CO. They are blessed to be raising 3 spirited young children, Bryson, Rebecca, and Raymond who keep them young at heart and truly show them God's loving hands at work in their lives. Desiree’s time away from home is spent as a Product Development Manager at Conagra Brands, Inc. She enjoys leading and coaching a team of food scientists that develop the food everyone loves to eat and managing new innovative food launches for brands such as Healthy Choice and Bertolli just to name a few. Outside of her time at the office and home one can usually find her supporting St. Patrick's as a soccer coach, leading a WoSP circle, or assisting with the Fish Fry events. Desireé welcomes the chance to be the Treasurer of the Woman of St. Patrick's to assist in leading the group through its second year. She has watched the WoSP grow through the first year of membership and aspires to see the group continue to grow to even bigger heights continuing to evolve and work for the women of the parish. Her vision for the WoSP is to involve more women and encourage involvement in many different areas of the parish by providing an atmosphere that is welcoming and inspiring. Desireé’s biggest aspiration for the WoSP is for more women to attend and participate in the monthly meetings and for our group to be represented in each of the parishes big events. Whether its supporting the event in the magnitude of volunteers or the entire groups sponsors a section of the event. Either way she would like for the WoSP to be represented at all major initiatives for the parish. She wants the WoSP monthly meetings to be the type of meetings that women truly will set time aside for to come because they want to not just because they have to. Stacy and her family joined the parish in 2014 and are so blessed to call it home. Her and her husband are proud parents to two children who attend St. Patrick’s School, Brynlee (Kindergarten) and Bryson (incoming preschool). Stacy has a rich background in fundraising, marketing, and development, prior to my current role of staying at home with our children. She previously worked at Youth Emergency Services for over eight years and was instrumental in tripling the size of the organization. At St. Patrick’s she is currently a parent volunteer, actively participates in two Circles and assists with Children’s Liturgy. Stacy feels blessed for this opportunity to serve on the executive board of the Women of St. Patrick’s in the role of Assistant Treasurer. With her previous experience, passion for fundraising and desire to be a part of such a powerful group of women leaders, she looks forward to uniting the women of our parish and growing Women of St. Patrick’s. With a strong first year accomplished, she envisions building off our successes and uncovering other needs for the women of our parish to grow in their faith and form new lasting partnerships. Stacy would like to see continued growth within our circles through an evaluation process developed to ensure each circle is making maximum impact for the women of our parish. She would also like to see membership growth through a targeted marketing effort utilizing social media and networking events. And above all, continued spiritual growth for the women of our parish. Jessi Sallenbach has grown up at St. Patrick's. She and her husband Jon, were married at St. Patrick's in 2006. Their daughter, Stella is 2. Jessi enjoys photography and sharing her talent through her business, J Sallenbach Photography in various ways with the parish. Recent projects were the pictorial directory in 2016 and Birthday Bash for Jesus in 2017. Jessi is also a travel nurse recruiter at Fusion Medical Staffing. Jessi would love to see us continue to grow this amazing group! The members and board have set the bar high thus far! She feels so blessed to have meet so many lovely ladies from all ages and walks of life. She personally would work to grow spiritual offerings and events bringing The Women of St. Patrick's together to socialize and pray alongside one another. Tiffany Gray has been a parishioner at St. Pat’s for 9 years. Her and her amazing husband Kevin have 3 kids- Will who’s currently in 3rd grade, Connor who’s currently in Kindergarten and Megan (who is a sassy and lovable 2-year-old). In between juggling everyone’s schedules and school activities, meeting with our mom’s circle and trying to find a moment of quiet (ha!) you’ll find Tiffany helping her clients buy and sell homes! She is honored to have been nominated for this position and would love the opportunity to serve our parish. Her background has always had a creative touch, from event planning, to musical theater and dance, to promotional marketing and real estate so when it comes to helping run events she tends to thrive amongst the chaos! The events that we host at St. Pat’s are always more than fundraisers to Tiffany- they’re a way that we can define our community. They encourage involvement, relationships both with our fellow parishioners’ and God and create a sense of community unlike any other. From older generations to the itty bitty babies of our church, Tiffany loves to see everyone come together to celebrate all that life has to offer, from the momentous occasions all the way to the day-to-day moments we share. Tiffany would love to see our community of women continue to grow and thrive as we work to strengthen our relationships with both God and each other. Erin Albers has been attending St. Patrick's Catholic Church since 2005. Growing up in small town Iowa, it was important for Erin, and her husband Steve, to find a parish with a small town feel with lots of potential for growth. After trying many churches in the area, they are so happy they landed at St. Patrick's. Erin has two children who attend St. Pats, Luke (11) and Piper (9). With a passion for women, children and seniors (She works at Home Instead Senior Care), Erin can't wait to watch the Women of St. Patrick's evolve and become something wonderful!